The Bay Area Council Economic Institute thanks the content contributors and generous funders of this project: Alameda County Transportation Commission, Altamont Corridor Express / San Joaquin Regional Rail Commission, The Cambay Group, Inc., Capitol Corridor, Greater Sacramento Area Economic Council, Innovation Tri-Valley, Metropolitan Transportation Commission, Sacramento Area Council of Governments, San Joaquin Council of Governments, San Joaquin Joint Powers Authority, San Joaquin Partnership, University of California at Davis, and University of the Pacific. We would also especially like to thank Shirley Qian, of the Capitol Corridor Joint Powers Authority, for her assistance in creating many of the maps used within this report, and Dr. Jeffrey Michael and Dr. Thomas Pogue, both of University of the Pacific’s Center for Business and Policy Research, for their data analysis contributions. 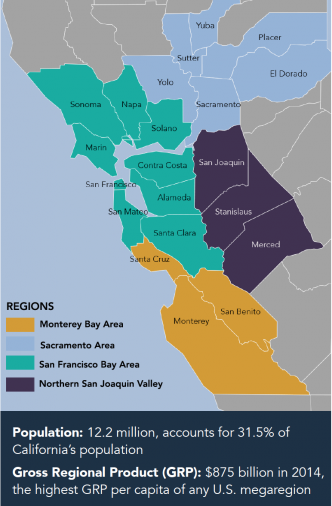 The Northern California Megaregion is composed of 21 counties grouped into four regions: Bay Area, Sacramento Area, Northern San Joaquin Valley, and Monterey Bay Area. It boasts one of the fastest growing economies in the country, joining the Texas Triangle and Gulf Coast as the only three megaregions to grow their gross regional product (GRP) at a compound annual rate greater than 5.0% since 2010. Population in the megaregion totaled 12.2 million in 2015. 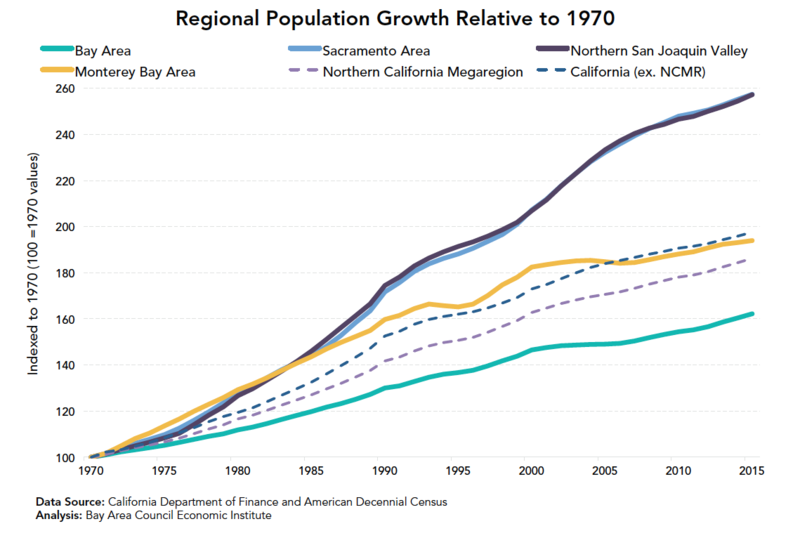 Since 2000, the Sacramento Area and Northern San Joaquin Valley combine for the greatest share of the megaregion’s population growth, with the grouping adding over 765,000 people. In comparison, the Bay Area has added 726,000 people over the same period. The Northern California megaregion includes three of the fastest growing counties in the state. San Joaquin, Santa Clara, and Yolo counties were ranked second through fourth, respectively, in 2015 percentage population growth—all with a 1.3% annual increase. Since 2010, the Bay Area has accounted for three- quarters of megaregional job growth—fueled by strength in technology- and information-related sectors. While the Bay Area had fully recovered from the recession by early 2012, the Northern San Joaquin Valley and the Sacramento Area have only recently reached their pre-recession employment peaks. Potential exists for greater interconnectedness of the economic engines of the Northern California Megaregion. New technologies have permeated industries such as food production, healthcare, and logistics, revolutionizing the way business is conducted and creating new types of companies, jobs, and economic opportunity for the entire megaregion in the process. The megaregion’s diverse set of universities, national laboratories, research institutions, entrepreneurs, and large and small businesses provides the foundation for a robust innovation system—arguably, the most dynamic in the entire world. Universities within the megaregion received over $3.7 billion in 2014 for research and development, and they are increasingly partnering with business to commercialize these efforts. The megaregion’s four national laboratories also provide thousands of direct jobs and are key cogs in the innovation environment. Since 1990, the Sacramento Area has had the greatest increase of workers in the high-tech sector (on a percentage basis) of any California region, as the region’s economy transformed from one rooted in agriculture to a much more diverse structure. Even with this growth, high-tech sectors make up only 6.7% of total Sacramento Area employment, below the average for the state. By contrast, 19.1% of Bay Area workers were employed in high-tech sectors in 2014, and their numbers totaled over 685,000. 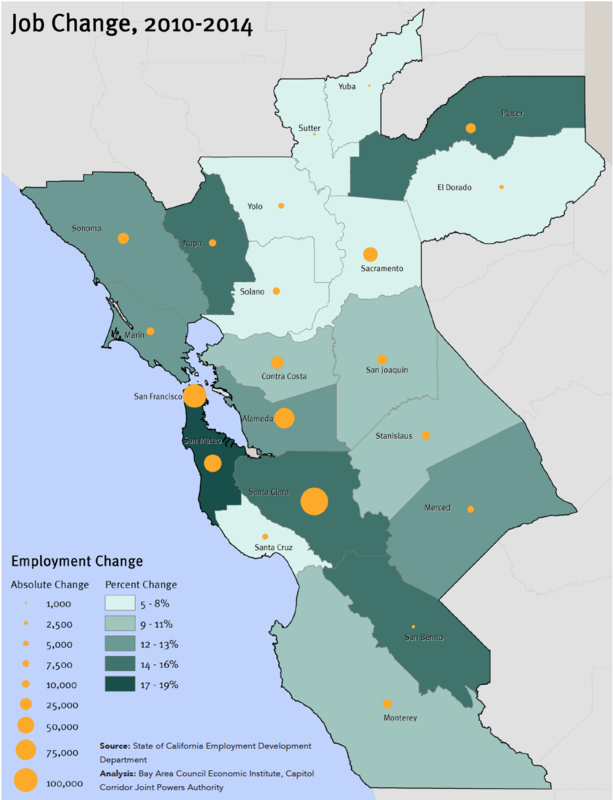 High-tech employment in the Bay Area has grown by 18.7% (or over 108,000 jobs) since 2007, giving it the biggest percentage increase of high-tech employment of any California region. Educational attainment levels continue to be an issue that prevents companies from expanding across all parts of the Northern California Megaregion. In 2014, 70% of the Bay Area workforce had obtained some type of post-high school education. Conversely, this number is only 51% in the Monterey Bay Area and 49% in the Northern San Joaquin Valley. 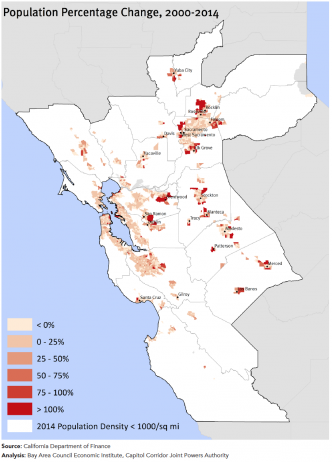 Housing affordability issues in the Bay Area have been one cause of the population influx in the inland portions of the megaregion. 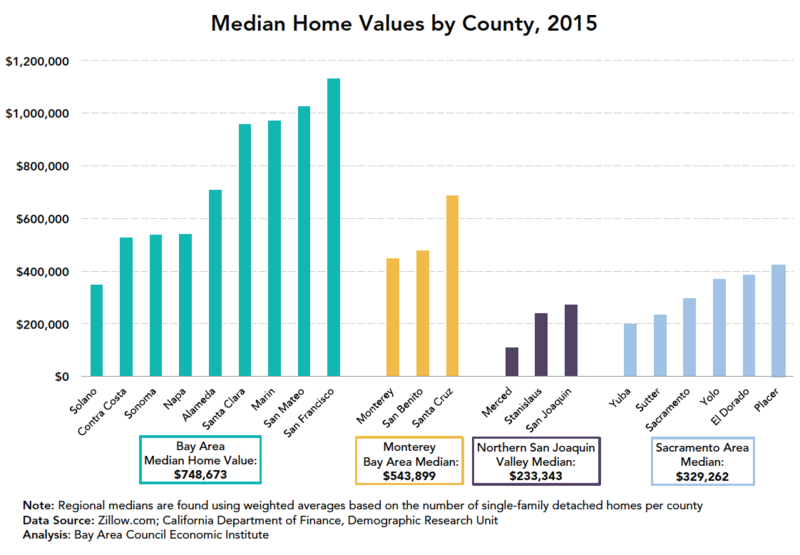 With a median home value of nearly $750,000 in 2015, Bay Area home prices are three times higher than the median price in nearby Northern San Joaquin Valley. Only three metropolitan areas within the megaregion have 2015 median home prices above their 2006 levels: San Francisco (up 49.1% since 2006), San Jose (up 17.9%), and Santa Cruz (up 6.3%). Inland areas of the Northern California Megaregion have experienced home price movements in the opposite direction. The largest price declines since 2006 have occurred in Merced (down 48.4%), Stockton (down 36.3%), and Vallejo (down 32.5%). Between 2004 and 2014, the Bay Area has experienced a total net migration loss of 143,500 people to other areas of the megaregion. The populations of the Northern San Joaquin Valley and the Sacramento Area in particular have been impacted by this population shift over the last decade. The interconnectedness of the megaregion’s labor market presents challenges to the environment and opportunities for improved transportation connections. While the megaregional workforce has increased by 17% between 1990 and 2013, commuters crossing regional boundaries have grown by 78%. 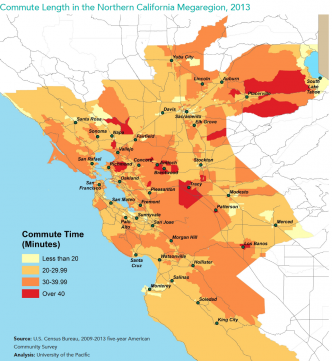 Of all 191,500 commuters crossing regional boundaries in 2013, 68.7% were commuting into the Bay Area for work. The growth of Northern San Joaquin Valley commuters to the Bay Area has been particularly dramatic, more than doubling from 1990 to 2013 and now comprising 15.8% of the Northern San Joaquin Valley’s resident workforce. The longest commutes in the megaregion originate in cities such as Pittsburg, Antioch, Brentwood, Tracy, and Lathrop. Additionally, San Joaquin County places in the top 10 nationally for its percentage of residents with a commute over 90 minutes long. 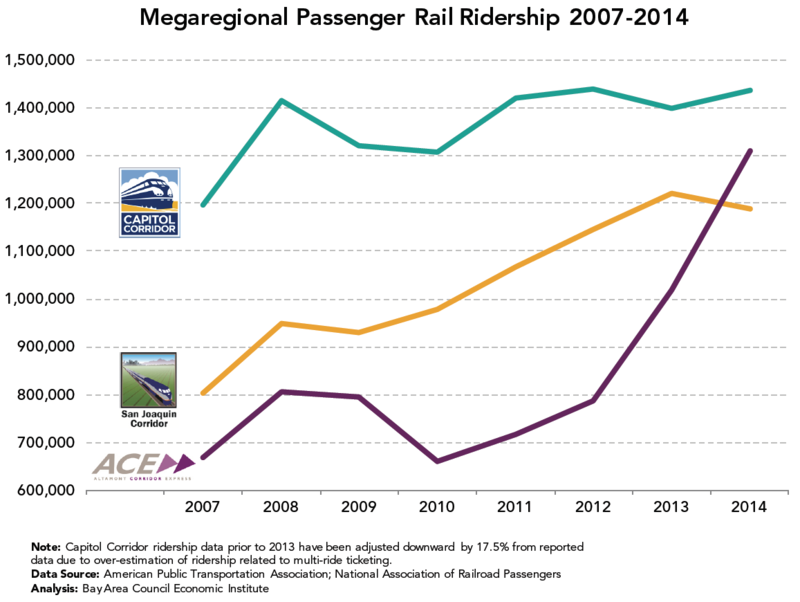 Each of the megaregional transit lines—Altamont Corridor Express (ACE), Capitol Corridor, and the San Joaquin—carries more than 1 million passengers annually, and ridership growth is especially strong on the routes serving the Northern San Joaquin Valley. All three of the systems also have ambitious plans to drive further ridership increases, and the future California High Speed Rail will bring even more passengers into these systems. The megaregion is the key economic unit for more integrated goods movement planning. For 2015, it is estimated that just over $1.0 trillion of freight moved to, from, or within the Northern California Megaregion. Trucking accounted for 74.1% of all of these freight flows. Many of the megaregion’s highway corridors carry between 5,000 and 15,000 trucks per day. 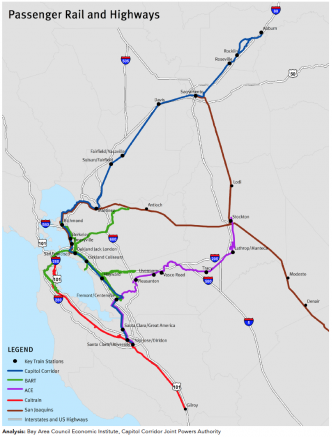 However, segments of I-880, the I-580 Altamont Pass, and I-5 between Stockton and Manteca—which connect the Port of Oakland to the Northern San Joaquin Valley’s intermodal terminals—carry between 15,000 and 37,000 trucks per day on average. The most congested rail lines in the Northern California Megaregion are those that serve the dual purpose of freight and passenger movement. Projections for 2020 show that many of the major rail segments in the megaregion will be operating very near capacity, limiting the potential to increase the number of trips for freight and passengers. There are urgent environmental and economic imperatives to plan for future population and job increases in a manner that does not stop at regional borders but ex- tends across the megaregion. Broadening the job base and creating a more efficient transportation and goods movement network are necessary for the state and the Northern California Megaregion to reach greenhouse gas emissions reduction targets under the Sustainable Communities Act. The issue of educational attainment is key to economic prosperity in the Northern California Megaregion, and it is an issue where mutual advocacy at the state level can lead to improved funding outcomes. It benefits the state and the megaregion as a whole for expanding businesses to locate in nearby geographies within the Northern California Megaregion, as opposed to other U.S. locations. To achieve the needed level of workforce talent to realize a greater degree of “near-shoring,” investments in the California State University system, the community college network, and apprenticeship programs should be made aggressively in those areas that need them most. Growing industries in inland areas—such as those related to healthcare, business services, and logistics— should be the targets of expanded community college certification efforts with curriculum input from the employer community. The current system of locally-oriented economic development efforts does not lend itself well to information sharing across the megaregion and can result in missed opportunities to have businesses expand, remain, or start within the Northern California Megaregion. 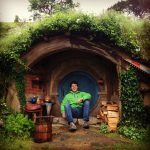 This is especially true for Bay Area companies that are opening new offices in Seattle, Portland, or Austin, when places such as Davis or Sacramento could have provided simi- lar workforce profiles and affordable office space. The amount of capital that flows through the Bay Area is one of the main reasons that it has built a diverse economy that allowed it to quickly recover from the Great Recession. The Governor’s Office of Business and Economic Development can incentivize the movement of more capital to other parts of the megaregion with a package of tax credits. This package can include a venture capital investment tax credit, a geographically targeted research and development tax credit, and a New Markets Tax Credit at the state level. in the megaregion, the megaregion’s four national laboratories, and smaller institutions that act as important economic development drivers in their specific geographies. The ACEforward plan calls for six daily round trip trains by 2019 and at least 10 daily round trips by 2023 (increased from the four current round trips today). A second component of ACEforward ex- tends its service area to the downtowns of Manteca, Modesto (by 2018), Turlock, and Merced (by 2022). Frequency and the time of day served are major impediments for the San Joaquins to serve the com- muter market between the Bay Area, Northern San Joaquin Valley, and the Sacramento Area. A greater number of San Joaquins trips has the potential to serve more non-commute intercity trips, which include trips taken for business and leisure purposes. Capitol Corridor has a long-term vision to reduce travel times through a series of targeted major investments. 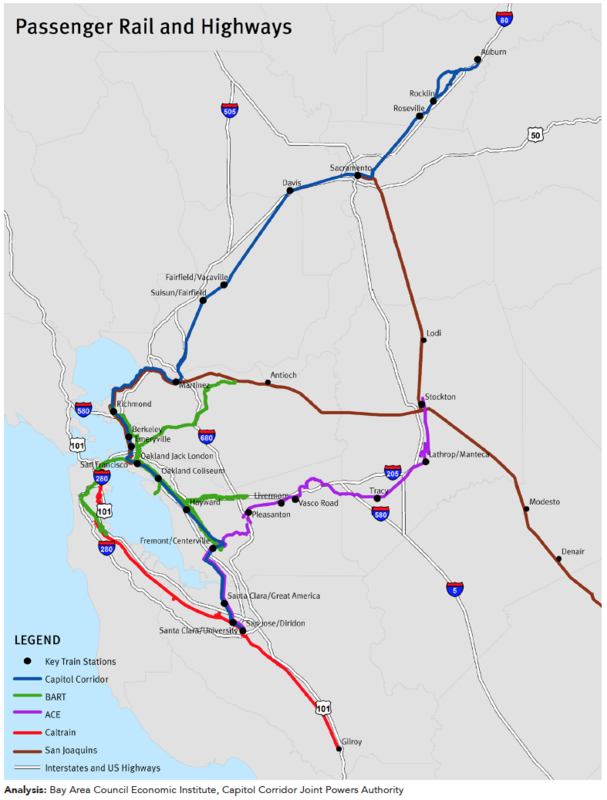 The agency also plans to increase the number of daily round trips while extending service to Salinas in Monterey County and Auburn/Roseville in Placer County. For California High Speed Rail to have its desired effect of improving connectivity across the state, it needs connections to a megaregional network that can efficiently distribute the regional and megaregional com- mute market. Investments in the three rail systems in the megaregion can create expanded ridership that can also connect efficiently to high-speed rail. With a gross regional product of $875 billion in 2014, the Northern California Megaregion accounted for 5.0% of total U.S. gross domestic product (GDP). This figure makes it the fifth largest megaregional economy and the most productive, with the highest GDP per capita. The entire megaregional transportation network would benefit from improved connections between its rail services. There are opportunities for investments in megaregional transit hubs in Livermore, San Jose, and Oakland, and they should be prioritized in the 2018 California State Rail Plan. Infrastructure projects that span the megaregion require partnership and support from a megaregional group of stakeholders. These projects have extensive megaregional benefits—they take vehicles off of roadways, lower greenhouse gas emissions, and improve local economies by making them more attractive places to live and work. These benefits need to be recognized across the megaregion so that a coalition can support efforts to gain funding from Sacramento and Washington. Funding sources for intercity passenger rail improvements might include tapping into the 40% of cap-and- trade funding that is currently unallocated. There should be a larger, on-going allocation of cap-and-trade funds to intercity and commuter rail services. While the Transit & Intercity Rail Capital Program receives 10% of cap-and-trade revenues each year, intercity and commuter rail services are not well positioned to compete against local and regional transit services for these dollars. Governor Brown proposes that cities and counties require only “by-right” approval for certain types of housing projects. By-right approval can help to spur housing development across the Northern California Megaregion. Most importantly, it can facilitate higher density building near existing or planned rail stations that will give residents greater choice in where they live and work. Investments that increase train frequencies can have the effect of increasing demand for transit-oriented housing—this proposal can make that housing a reality. Additionally, the new stations that are built as a result of high-speed rail construction will more quickly promote economic revitalization, as developers will have more certainty of the types of building that will be approved. The issue of growing demand for freight and passenger rail is unsustainable. With the megaregion’s transit operators planning enhanced service and freight operators wanting to keep right-of-way available for their own future expansion, coordination between private freight operators and public stakeholders needs to have a more defined structure to reach mutually beneficial outcomes. 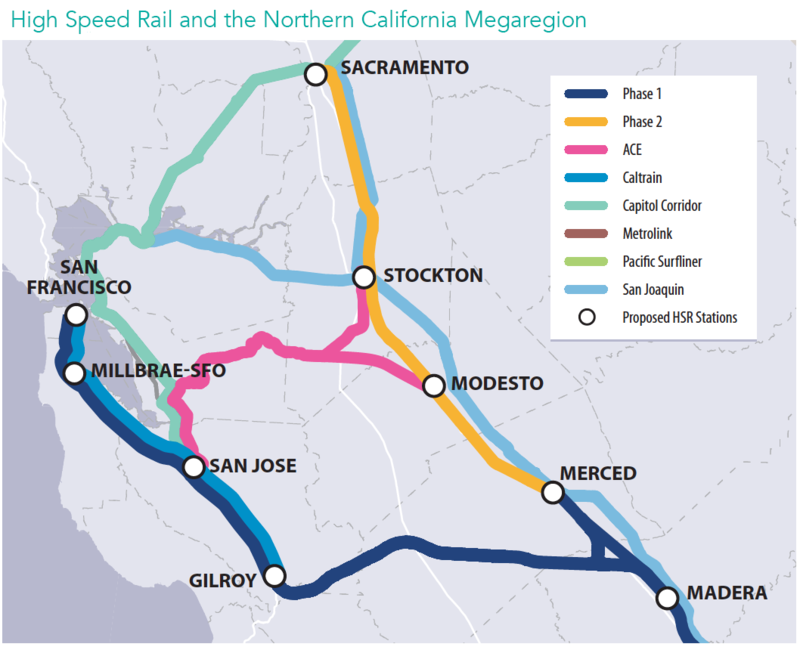 The Metropolitan Transportation Commission in the Bay Area, the Sacramento Area Council of Governments, the regional transportation planning agencies of the Northern San Joaquin Valley, and the rail agencies of the Northern California Megaregion have begun working together to advance megaregional planning. This partnership should be the focal point that acts as the point of contact for engagement with private rail operators going forward. It can ensure that passenger rail efficiently links the megaregion while freight operators continue to meet their market objectives. Many policies that can be implemented at the Port of Oakland have goods movement co-benefits that extend into the megaregion. For example, if more trucks load and unload at the Port of Oakland at night, truck traffic in the Northern San Joaquin Valley can shift away from peak travel times. An increased usage of technology in goods movement, such as improved tracking and coordination of truck arrival times at the port, can also limit the amount of time trucks spend idling while waiting to enter and exit. The public sector should partner with private industry in making investments in goods movement. These investments might include more seamless rail connections and dredging to accommodate larger vessels in the Stock- ton shipping channel. The impacts of the $880 million investment planned at the former Oakland Army Base will also stretch across the megaregion with large public benefits. These types of policies and investments that have megaregional significance should be supported at a similar geographic level. The Northern California Megaregion’s policymakers should help the state designate freight corridors of need. Projects identified in these corridors would be able to quickly access state funding when available and have the state’s support in efforts to garner funding from the recently-signed FAST Act, the federal government’s transportation spending plan. Future packages of freight rail investments supported by public funding might also be part of a deal that allows passenger rail to operate through dedicated rail corridors apart from freight traffic.